To all my tribal, aztec and indie print lovers out there, this one is for you! 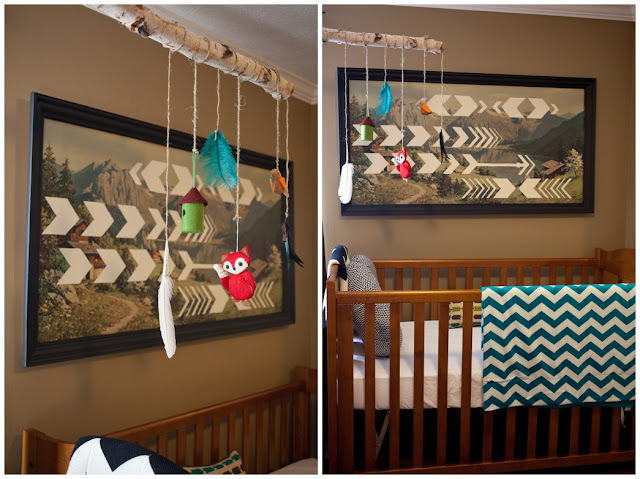 I don't even know where to begin with this beautifully designed nursery. This space has everything you would need to fulfill a tribal themed nursery. What has me so inspired is not only the way it all flows and the cohesiveness it displays, I am mostly excited about all of the diy and homemade pieces. Now that the tribal trend has worked it's way to baby fashion for girls and boys, why not extend it into their little baby oasis we call their nursery? Talented photographer Leslie Moss, owner of Leslie Savage Photography and her husband Todd did just that while awaiting their "Mini Mossman"'s arrival. All of the eclectic pieces, adorably displayed throughout this space are handmade and purchased gifts from family and friends. You will find several refurbished pieces accented with a bit of artistry and craftiness from both Leslie and Todd as well as thrift and Etsy purchases. Be sure to scroll through slowly, you don't want to miss out on their cleverly incorporated details and uniquely assembled works of art. 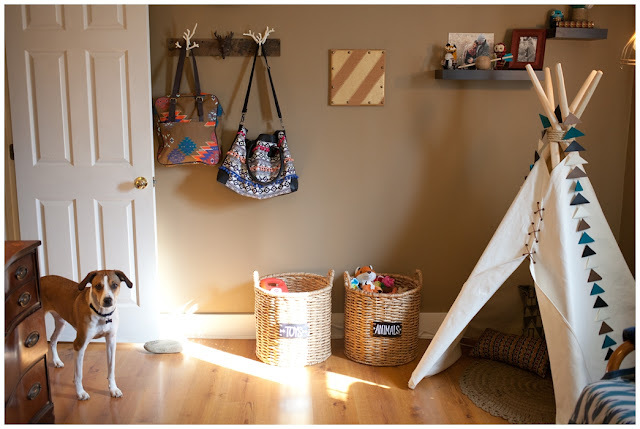 Diaper Bags are hanging from hooks, Leslie purchased from Urban Outfitters, that Todd attached to an old board. Genius! 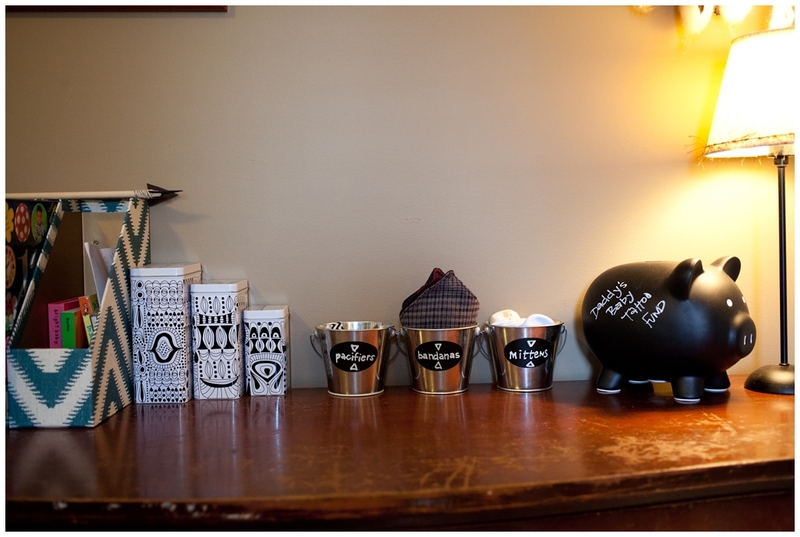 Organizational baskets are from Target. 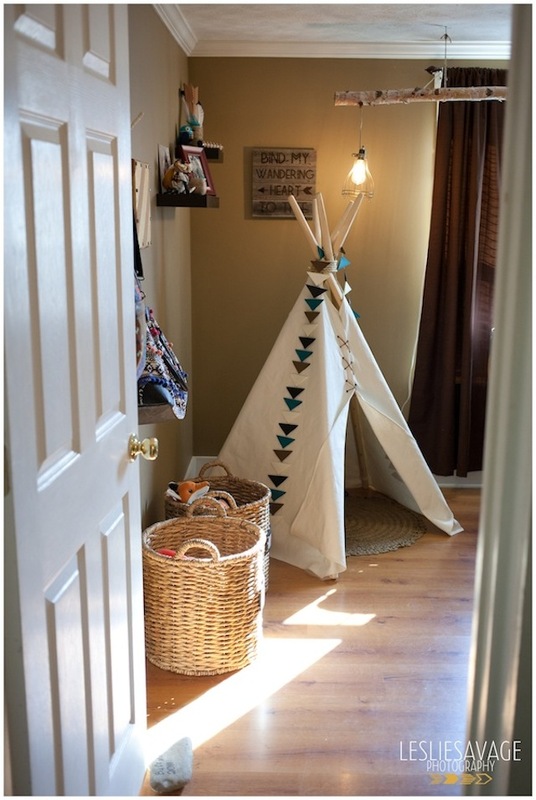 Teepee is from Etsy Shop: House In Habit . 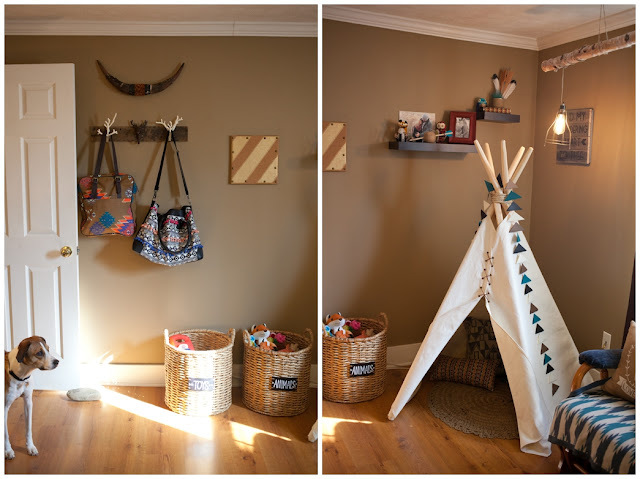 The aztec garland was handmade by Leslie's cousin Kelsie Wilkens as decor for their baby shower. 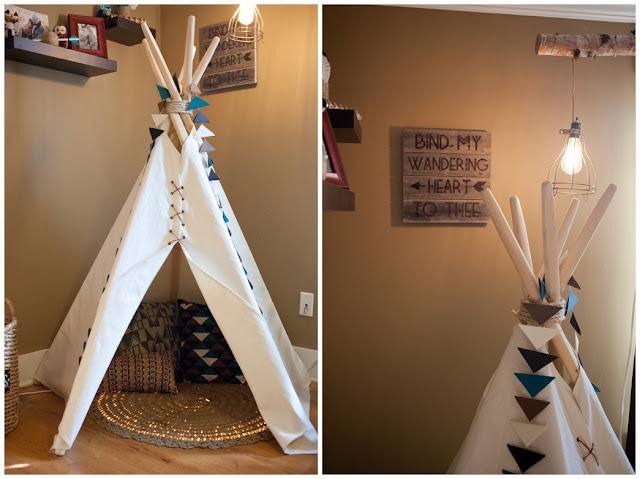 Leslie decided to drape it over the teepee for lack of better placement, what a brilliant last minute adjustment! 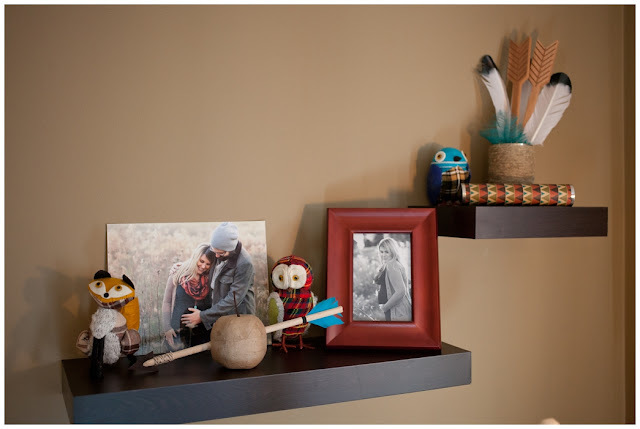 Feathers are resting in a twine-wrapped spaghetti-o's jar and a family friend hand-made the arrow-speared apples as decor for their baby shower. Perfectly incorporated! 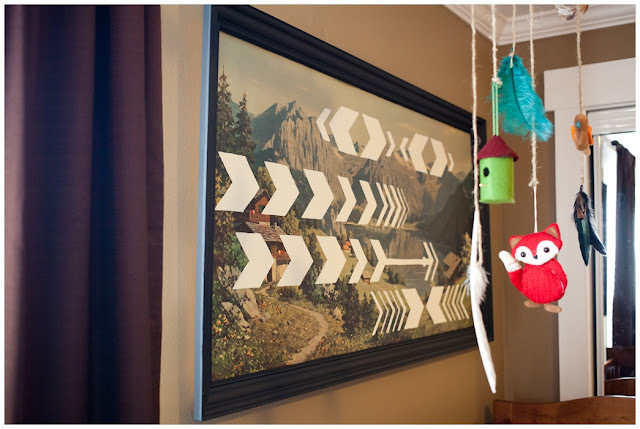 The mobile is made out of christmas ornaments, feathers and a cat toy (the bird chirps!) hanging from a beautiful birch wood branch. 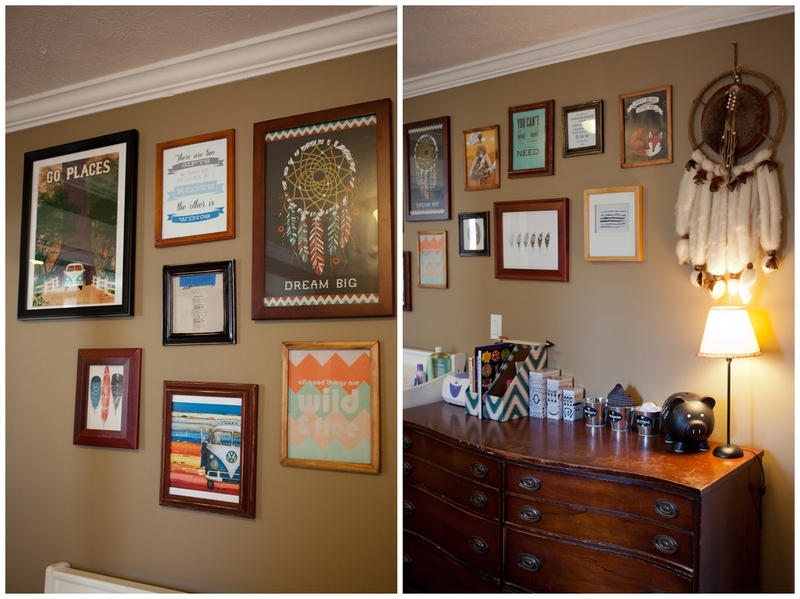 The picture was thrifted and spruced up with a painted frame and beautiful tribal design painted on by Leslie. 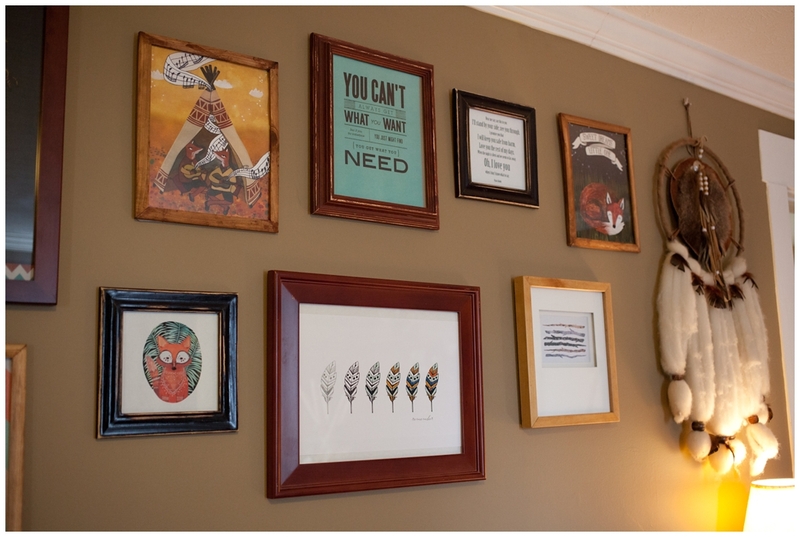 The photo wall consist of gifted prints, purchased and printed artwork and some handmade by Leslie. 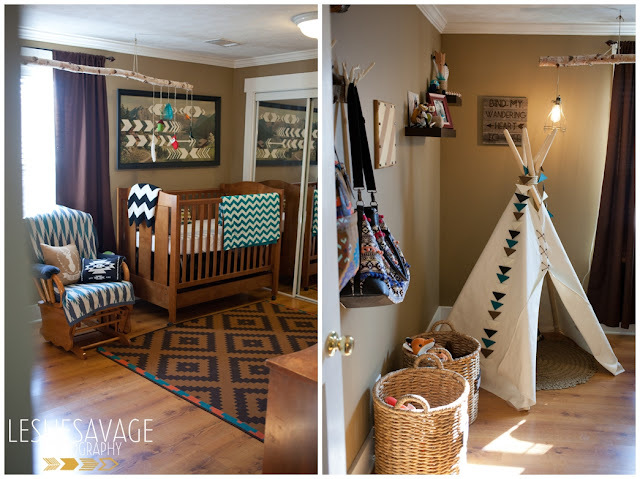 For more info regarding this beautiful baby tribal abode or want to be blown away by more of their diy gems, visit Leslie Savage "Personal" Photography blog! 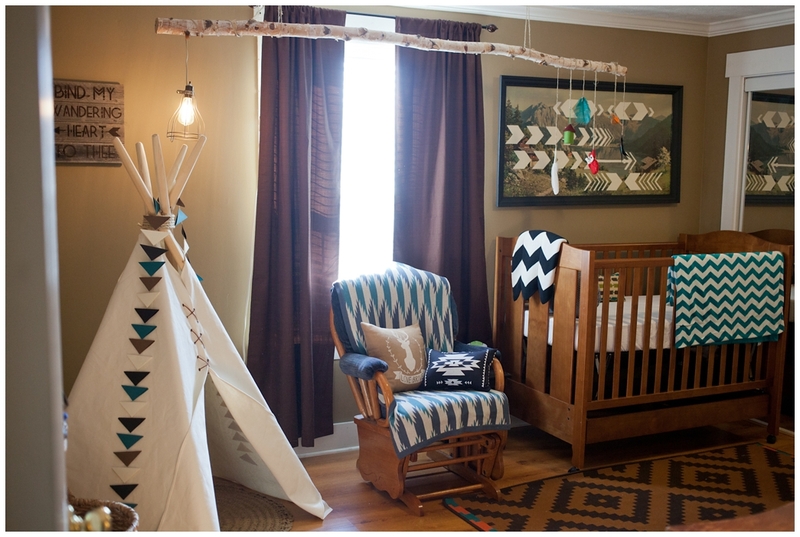 this room is seriously my favorite nursery/kids room I've ever seen. Can she come to my house and do that?!! Love your blog and I'm freaking out over this nursery. Amazing! This is amazing! I can't imagine how much time it took to put together this space. What a great room!!! Do you know what the paint color used is?